Pyramid Hill is a rural township between Bendigo and Kerang, 90 km north of Bendigo. 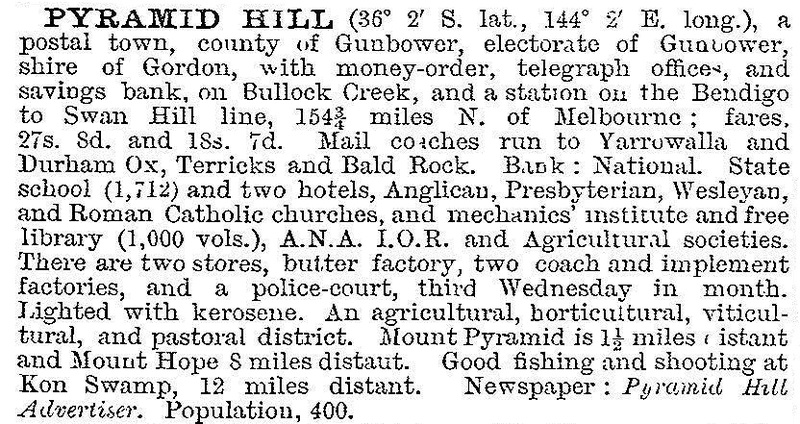 The hill is 3 km east of the township, and it was described as ‘a triangular pyramid, and, being quite isolated, it closely resembled the monuments of Egypt’ by Thomas Mitchell, Surveyor-General of New South Wales. Mitchell observed the hill from Mount Hope, 11 km north-east of Pyramid Hill, on 28 June 1836, on his Australia Felix expedition. The hill is one of a number of granite rises, set in plains which Mitchell observed were well distributed with water courses in wet seasons. On 29 June 1836 Mitchell’s party camped at the base of the rise he named Pyramid Hill. The Pyramid Hill district was in the Mount Hope pastoral run, taken up in 1845. In the early 1870s farm selections became available, and a hotel and a store were opened in 1874 near the foot of the hill. A Catholic church was opened in 1875 and a school in 1876. With opening of the Bendigo-Kerang railway through Pyramid Hill in 1884, the township grew quite quickly during the remainder of the decade. A local irrigation trust was formed (1886), Methodist, Anglican and Presbyterian churches were opened (1886-87) and an agricultural society was started (1887). A large general store was opened by John McKay (brother of Hugh Victor McKay) in 1885, becoming part of the holdings of the Pyramid Hill Cooperative Society in 1922. It was finally absorbed by the Murray Goulburn Cooperative. A butter factory ran from 1895 until 1973, using water from the local irrigation trust at first and then from the Waranga Western Channel system which reached Pyramid Hill in about 1912. The formation of the State Rivers and Water Supply Commission in 1905 and the extension of irrigation works during the following decade resulted in the population of the Pyramid Hill district expanding until the outbreak of World War II. Town amenities were enlarged, including a memorial hall (1925), a bush nursing hospital (1932) and the town’s fifth church, the Church of Christ (1926). A Catholic primary school was opened in 1956 with an enrolment of 60. It had about 20 pupils in 2010. The main irrigation areas are west and north of Pyramid Hill. Bullock Creek separates the town from the Pyramid Hill reserve, which is adjoined by a golf course. The township has a showground and facilities for cricket, football, bowling, tennis and swimming. There are silos near the railway, a quarry near the Pyramid Hill reserve and an airstrip. Within the town there are a hotel, a caravan park, a recreation reserve, a bush nursing centre, a shopping centre, four churches, a hall and a nearby historical museum. The railway station (1888) and goods shed are heritage listed. The State P-12 college had 100 pupils in 2014. At the 2011 census, farming accounted for 47.5% of employment in Pyramid Hill and environs.